Next November 15, Tuesday, has been the date chosen to officially show the OnePlus 3T. It has been the same Chinese company that has confirmed through its official account on Twitter said date, so the news does not leave much room for interpretation. For now everything indicates that the letter T as a suffix of OnePlus 3 is an indication that both will have some similarities. At the moment only the presence of a Snapdragon 821 SoC is confirmed, something that in fact had been confirmed first by Qualcomm, whereas the rest of the specifications will not be mentioned until next Tuesday. We are many who, however, expect big changes, whether with respect to a different camera, being a little skeptical, or with somewhat modified software compared to that of OnePlus 3. Changing the Snapdragon 820 CPU by Snapdragon 821 can mean the same for many, that is why OnePlus is expected to develop different mobile devices in parallel, given the good result obtained so far with the first releases. Therefore it is more than likely that the OnePlus 3T offers changes to other components, such as RAM, storage or battery (perhaps). According to many rumors circulating on the network, the Chinese's new smartphone should have a similar design to the OnePlus 3, so it would not be a new series of cell phones, but a more powerful version of the model already on sale. 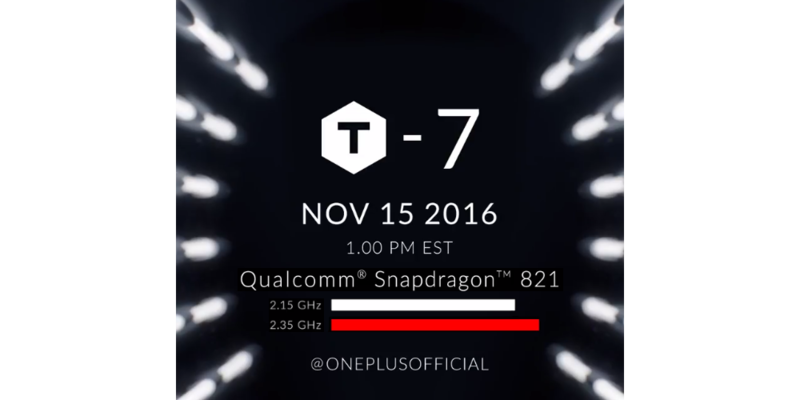 Therefore, the only certainty is the Snapdragon 821 at 2.35 GHz versus the Snapdragon 820 at 2.15 GHz. The Snapdragon 821 is compatible with Google Daydream VR technology and with the automatic dual-phase detection focus, which is faster than traditional PDAF. The OnePlus 3T should have a 5.5-inch screen with Full HD resolution (1920 x 1080 pixels), 6 GB of RAM LPDDR4, 64 GB of UFS 2.0 flash memory, cameras with 16 and 8 megapixels, and 3000mAh battery, Oxygen OS operating system, based on Android 7.0 Nougat and an improvement at the hardware level can lead to a slight increase in price from $ 399 to $ 479. Just yesterday in Geekbench appeared a mysterious device called OnePlus Pixel. A name that draws much attention at the moment, due to the new line of phones produced by HTC for Google, and composed as we know by the Pixel and Pixel XL. According to the benchmark website, this new cell phone will feature a Qualcomm Snapdragon 820 processor at 1.59 GHz, 6 GB of RAM and the Android 7.1 Nougat operating system. In principle this OnePlus Pixel has nothing to do with the OnePlus 3T; in fact, we expect it to be a brand new smartphone. Awaiting to know more about it, it is worth remembering that for the moment we should not take this type of leaks too seriously, because it would be very strange that suddenly the Chinese brand had decided to manufacture many new smartphones. After all, just a few weeks ago the company executives said they wanted to focus only on a small group of devices.